"The library connects us with the insights and knowledge, painfully extracted from nature, of the greatest minds that ever were, with the best teachers, drawn from the entire planet and from all our history, to instruct us without tiring, and to inspire us to make our own contribution." The ASV Library has books, DVDs, CDROMs, copies of articles, and other items covering all areas of astronomy, cosmology and other related topics. Most of these items are available for borrowing by members. In your Library, there are over 3,000 books and other printed items. Included in these, are over 900 texts introduced since mid 1998, over 200 printed articles and about 60 antique books and other items. Also, there are over 300 DVDs, including over 80 DVD sets, 35 CDROMs and about 70 Videos and Video CDs. The ASV subscribes to the magazines, Astronomy, Sky & Telescope and Australian Sky & Telescope. Bound copies of Astronomy and Sky & Telescope magazines, may be perused in the library. Copies of old magazine articles can be printed on the Library's printer for a small price. Newsletters and bulletins are received from most Australian, and many overseas, societies. The historical section of the library houses books published prior to 1912 and valuable first editions. Though not for loan, members may peruse these in the library. You can find a listing, by category, of all the library's acquisitions since mid 1998, below. All books and other items placed in the Library before mid 1998 can be located using the older card system in the Library. As an ASV member, you automatically have full borrowing rights. Members are entitled to borrow up to 3 books, 2 DVDs or CDROMs and 4 magazines per month. Loans can be extended for an extra month unless another member has reserved the item. 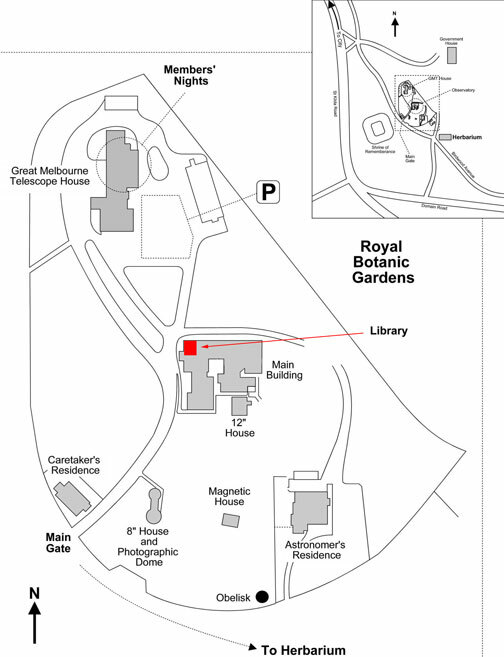 The main ASV Library is situated at Melbourne Observatory in the north west corner of the main building near the car park. Parking is available for library users when the Library is open on the last Sunday of each month, in the car park adjacent to the Great Melbourne Telescope House. There is also a selection of books, magazines and newsletters at the ASV Lodge for member's use, with the junior Library being also located at the ASV Lodge. Monthly Meeting nights from 6.30 pm to 7.50 pm and from about 10.15 pm to 10.45 pm. Click here to update the library (administrator only).